Dr. Jennifer Taylor is originally from Indianapolis, Indiana. 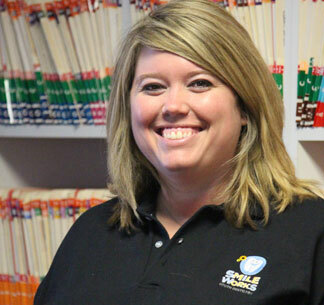 She moved to Fort Wayne in 2006 to pursue her passion for providing dental treatment to children and young adults. She obtained her Bachelor of Science in biology from Indiana University in 2001, and in 2005 her Doctorate of Dental Surgery from Indiana University School of Dentistry. Dr. Jennifer has been providing dental care for children and young adults ever since. Dr. Jennifer is a member of the American Dental Association and its local affiliate, Isaac Knapp District Dental Society. Dr. Jennifer and her husband Kevin have a daughter, Grace, and two cats named Hatch and Caddis. She enjoys spending time with her immediate and extended families. In her spare time she likes to read, fish with her husband, and travel around the U.S.
Dr. Jennifer looks forward to treating your children at SmileWorks Youth Dentistry!